The proposed building is seen in center in this rendering. On a Boston skyline dominated by office towers, John Hancock and the Pru are about to get a new neighbor: A 60-story tower of ultra high-end condos that will be the city’s tallest residential building. 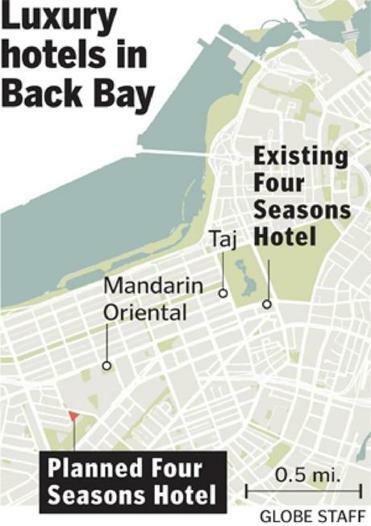 The $700 million project — next to the Christian Science Plaza — got a huge boost Tuesday when Four Seasons Hotels and Resorts said it will manage the hotel and residences in the building, promising to bring a new level of opulence to the already pricey Back Bay. At 699 feet, the building will be the largest of a new generation of residential towers planned to shake up a skyline that has been the exclusive province of hedge funds, banks, and insurance companies. 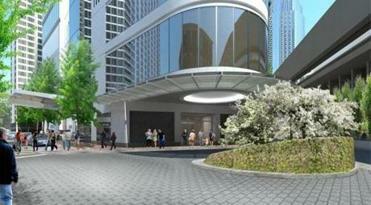 A 625-foot condominium tower is also under construction at the former Filene’s property. 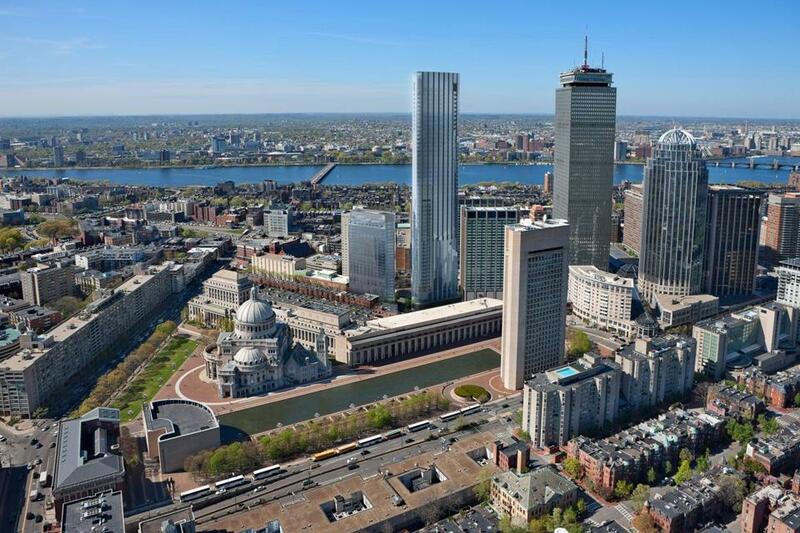 Other residential high-rises are planned at North Station, Copley Place, and Government Center. The project at the Christian Science Plaza by developer Carpenter & Co. will make Boston one of only a handful of cities with two Four Seasons hotels. The others include London, Shanghai, Instanbul, Los Angeles, and Chicago; New York is currently building its second Four Seasons. With the city’s condo market surging, Carpenter & Co. intends to start construction of its tower at 1 Dalton St. by the end of the year. The 211-room Four Seasons will occupy the first 20 floors of the building, and 180 condominiums will be spread across the upper 40. The Four Seasons will continue to manage its existing hotel on Boylston Street. The new skyscraper will become Boston’s third tallest structure overall, behind the 750-foot Prudential and the 790-foot John Hancock Tower, both office buildings. It will create a new bookend to the high spine of skyscrapers that runs between Boston’s downtown waterfront and the Prudential Center complex. The project is being designed by a partnership of Cambridge 7 Associates and Hancock Tower architect Henry N. Cobb, who will soon have two of Boston’s tallest three buildings to his credit. The architects shaped the building in an equilateral triangle with rounded corners, a form that is designed to mirror the geometry of the neighboring Christian Science Mother Church. Its hotel rooms and condos will feature sweeping views of the Back Bay skyline, the Fenway, and the Charles River. A public park will be built at the base of the building, and Prtizker Realty Group of Chicago plans to build a 26-story apartment tower on an adjoining parcel. The development of the property, formerly owned by the First Church of Christ, Scientist, was approved by the Boston Redevelopment Authority last September. Mayor Martin J. Walsh offered strong support for the project Tuesday, saying it will bring permanent and construction jobs and boost the city’s overall economy. In recent weeks, the mayor has emphasized the need for more middle-income housing in the city, but he said the Four Seasons project will cater to a luxury tourism market that is also critical to the city’s growth. The new tower will include two restaurants, two lounges, and a health club and spa. Its residences are certain to be among the most expensive in the city, challenging the Mandarin Oriental and new units under construction at Fan Pier. Friedman said prices have not been set. Condo prices in Boston have soared to record highs in recent months, with the average unit in full-service buildings downtown now selling for about $1 million, according to LINK, which tracks condo prices in the city. Units in several large buildings have sold for over $2,000 per square foot, a threshold seldom crossed in a city that is a relative newcomer to the super-luxury market. New York and London routinely achieve far higher prices, as do densely built cities such as Beijing and Hong Kong. Boston’s ascendancy into that market is fueling a burst of construction activity. More than 8,000 luxury residential units are expected to be built in Boston during the next three years, doubling the supply of units built in large, luxury complexes since 1960. Most of those units will be apartments, but developers are beginning to build condos as well. Several new hotels are also under construction. The new Four Seasons is designed to complement the existing hotel on Boylston Street. It will have smaller ballrooms and conference spaces, offering more of a boutique luxury product, according to Friedman. He said each of its condo units will feature bay windows and the building will be fitted with multiple elevator banks, so that residents will be able to take an elevator directly to their units instead of walking down long corridors. Some units will have balconies. With construction estimated to start by year’s end, the hotel and residences are expected to be completed in 2017.